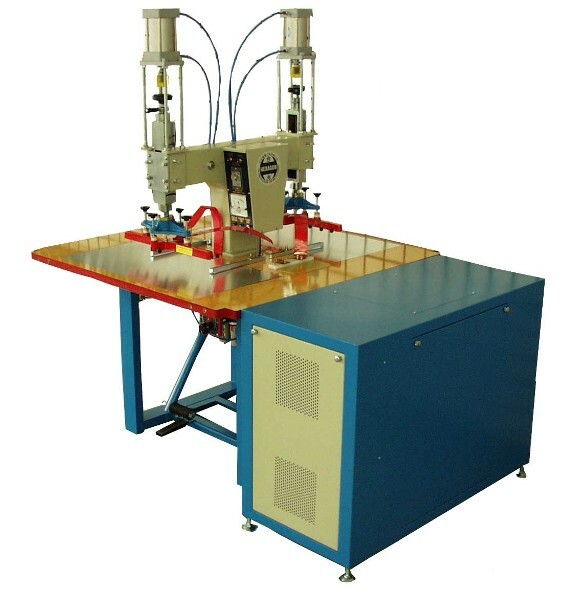 The principle of high frequency plastic welding machine is using dielectric heating method. Placing the plastic application in between two metal plates, high frequency voltage is connected to the two electrodes. The molecule start oscillate and generate heat in the electric field after power is turned on, and the fusion of plastic begins when it reach the necessary temperature. Placing two layers of plastic products in the electric field and apply pressure and heat at the same time, the two layers will then bond together with a strong hold. In the field of high frequency heating, some of the material will produce more heat than other materials; these materials are more suitable for high frequency welding. The degrees of the material molecular oscillations in the high frequency Electric field are the material loss factor. The higher loss factor indicates easier welding with high frequency method. The most suitable material is PVC and PU, and the PE and hard plastic are not applicable. The advantage of High Frequency Plastic heating is the internal heating of plastic materials created by the molecular vibration. The molecular bonded solidly together, which is entirely different from the external electric heating or radiation heating. External heating require penetration of the material in order to heat the inner part of material. However, the special principle of high frequency heating can uniformly heat up both inner and outer of products simultaneously.